Berkeley Lawn Bowling Club initiated its first Young Bowlers Program in April. 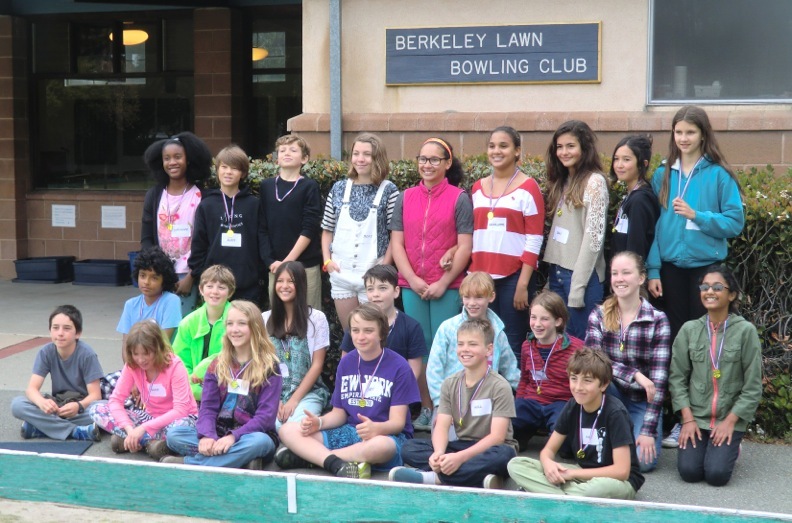 Twenty-three sixth graders (and one brave teacher) from The Berkeley School were introduced to lawn bowling. Club coaches set up four games of Triples and were on hand to help with learning how to bowl, to explain rules and strategy, and to ensure everyone had a great time. The student’s Physical Education teacher was on thegreen giving encouragement and watching their progress. The students were very enthusiastic and completely involved in the games. No slackers in this group! All the kids were awarded gold medals by their coaches. 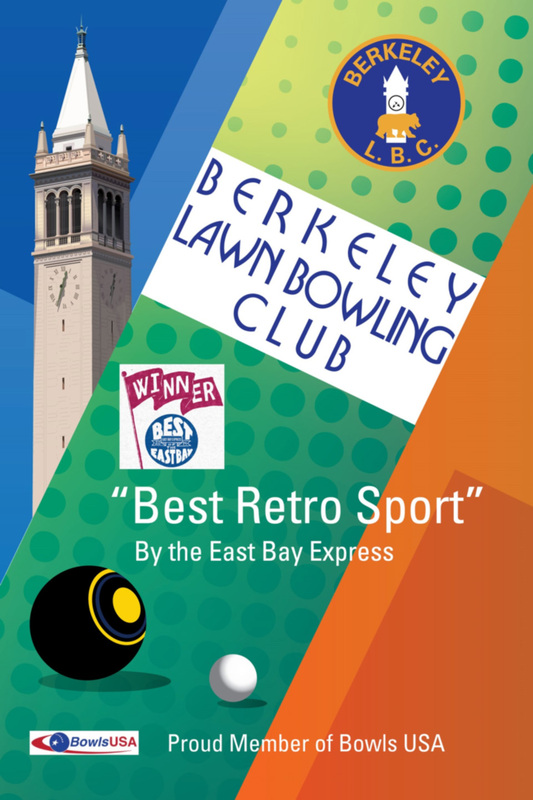 Our Club plans to continue the relationship with The Berkeley School as part of the School’s regular phys. ed. program. Who knows, maybe a future national champion is in the making? That elusive Meat Axe – gone again! 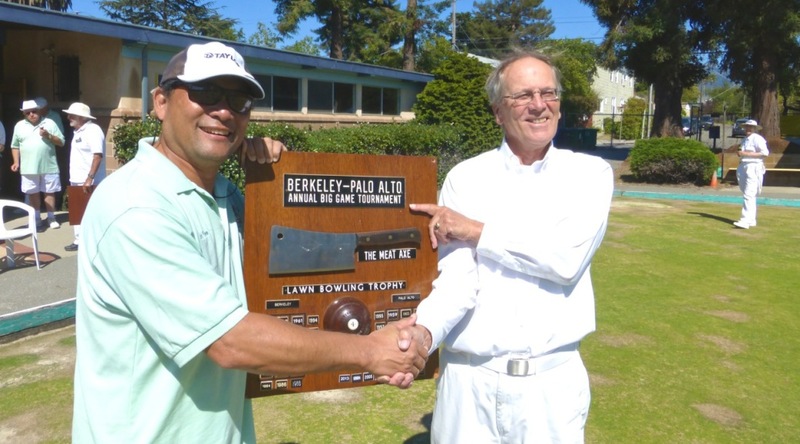 Well, it was deja vous all over again after Palo Alto came to town to defend the Meat Axe. Both teams fielded four teams (with only minimal use of dual members) for the competition. After tasty snacks and a few howdy-dos, it was game on as tournament director Howard Mackey gave us our marching orders. The green was running fast but did present a few challenges to all present. After the morning session, it was a dead heat – two games won by each club. So, after lunch, we were back at it. Palo Alto seemed unwilling to let go of the trophy and the going got rough. In the end, even though there was an attempted comeback or two, Palo Alto prevailed by winning 3 of the afternoon games. A special thanks to Cathy Dinnean, Ann Brillhart, Susan Jamart, and Jim Corr for all the behind the scenes work it takes to put on an event like this one. And finally, Erwin Vista deserves special mention. Not long ago, he was a novice. His performance this weekend and last as a skip was outstanding. Congratulations, Erwin, it was a pleasure to see how fine-tuned your shots have become. 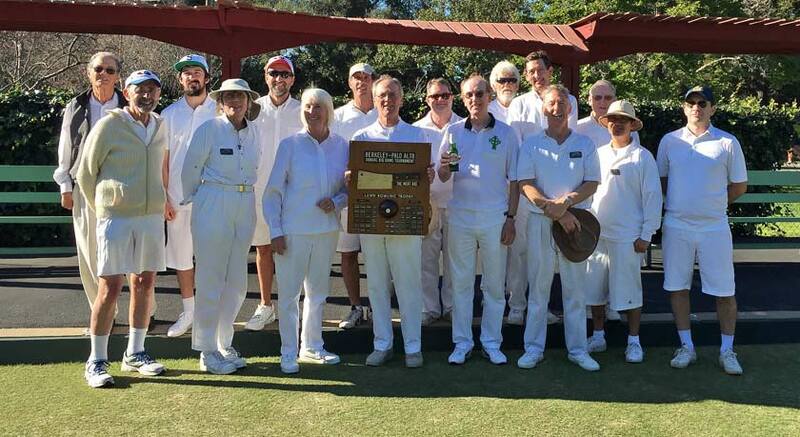 So, as you can see in the picture above, Palo Alto’s VP John Lee was please to take possession of the trophy for another year and President Phil Grattan did his best to look gracious as he shows off the “We Lost” trophy. John Yee takes possession of the Meat Axe from Phil Grattan, BLBC Pres. 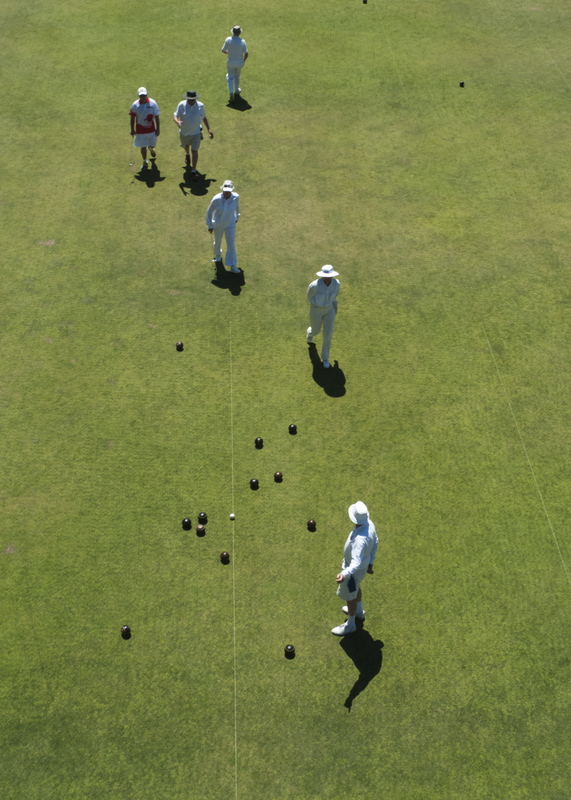 Eighteen bowlers showed up on time and ready to bowl in the club triples match today. The format was random draw with three fourteen end games. Dave Rockhold (skip) with Xian Zhi Luo (vice) and Andy Stapleton (lead) finished in second with two wins and 16 plus points. It was indeed a beautiful day with a refreshing breeze to moderate the expected hot weather. 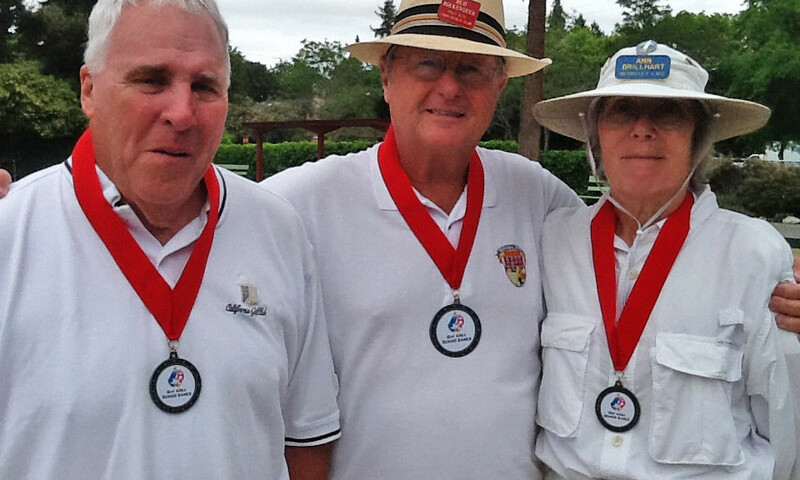 Our other BLBC member, Ann Brillhart, above, won a silver medal in triples with teammates Bud Birkenseer and Sam Hebert. 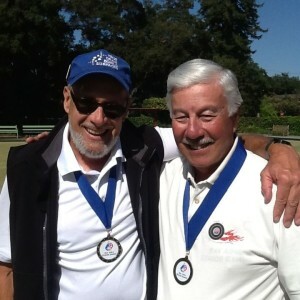 Bud, Sam and Ann won the bronze medal last year. Let’s hope they can win the gold next year! Which would it be? 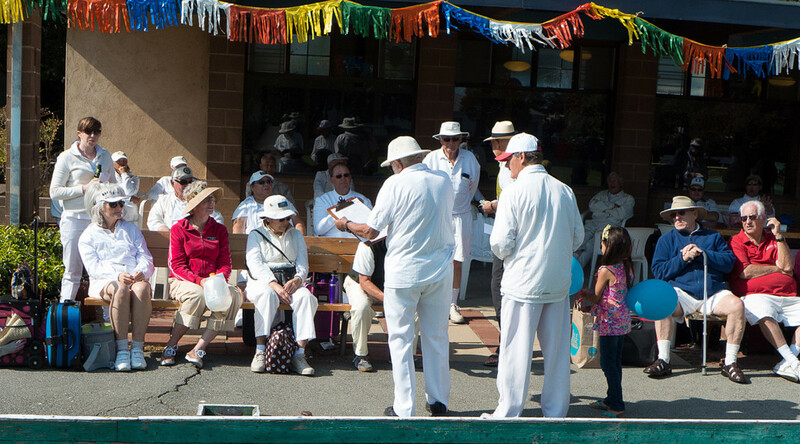 The first definition of jamboree in the Merriam-Webster Dictionary is “a noisy or unrestrained carouse.” This seemed improbable as I watched 42 bowlers from around the Bay Area arrive for the 2014 BLBC Jamboree. To the neighborhood’s relief definition no. 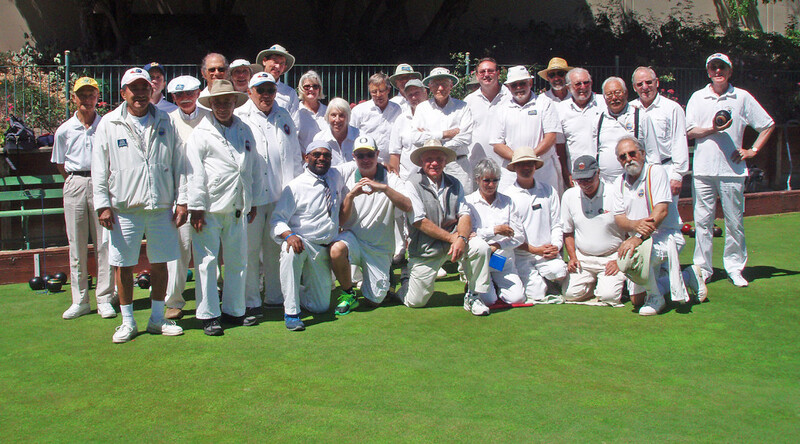 2 – “a large festive gathering” – was more applicable for our fine day of bowling under pleasant skies. 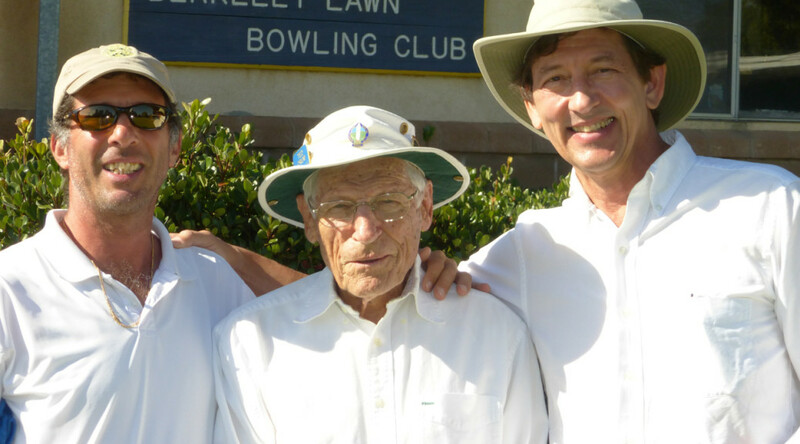 Holding court in front of a clubhouse festooned with banners and ruffles, Tournament Director Howard Mackey orchestrated event logistics using naught but the notes on two sheets of paper. The format was three rounds of 10-end triples, matches that provided participants with new teammates and a new rink for each game. 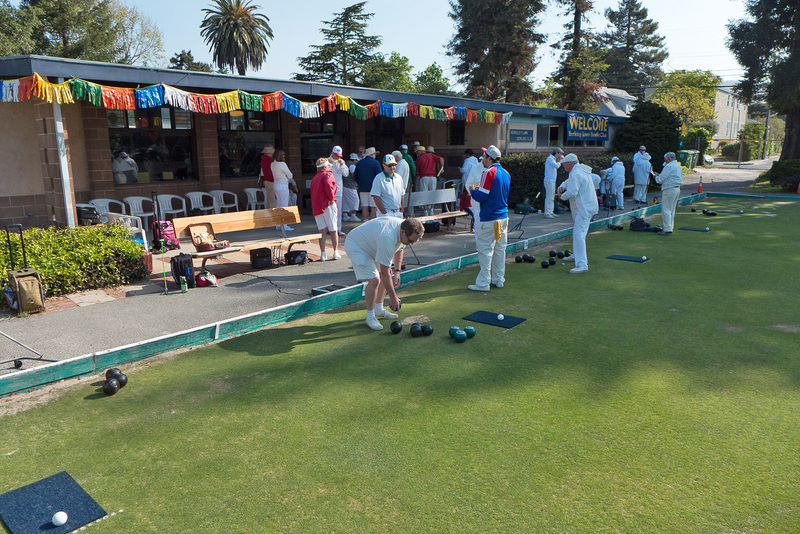 In testimony to the Greens Committee’s hard work, the rinks bowled well (for the most part) and those challenged by the peripheral lanes met that challenge with good cheer (again, for the most part). At the end of day some folks were up in points; others down. But all had enjoyed a fine day of bowling in good company and, of course, ice cream. 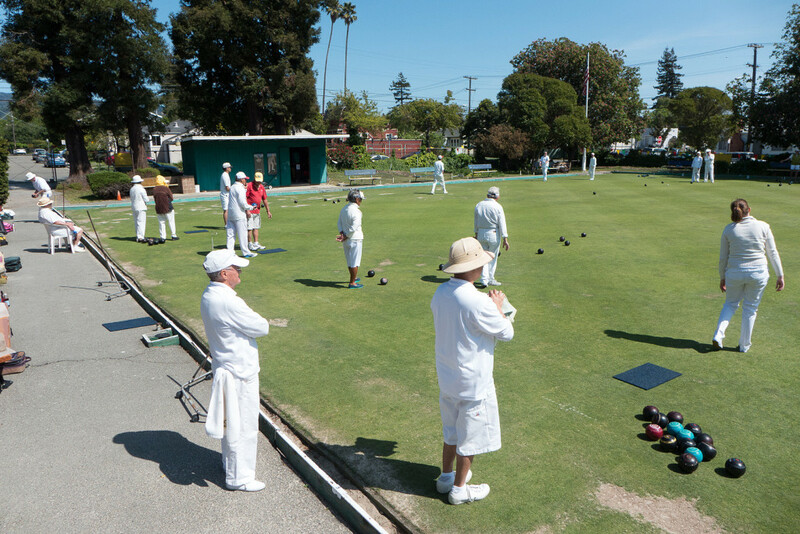 Please be patient as we rebuild the Berkeley Lawn Bowling Club WWW site in a new, fresh server space. Stay tuned for the new look. Hmmmm, come to think of it if you are reading this you can see the new look already. Update: 8 April – the redesign and relocation of our WWW site is near complete. If you notice anything amiss please bring it to the attention of me or Dave Rockhold. 1. There is a new mowing schedule. Jose will be mowing the green Tuesdays and Fridays from 2:30 to 4:00. Please do not arrange games which interferes with this schedule. 2. Cathy has completed the 2014 club roster and it is available for pickup at the club. Please review your contact data for accuracy and advise Cathy if there are any errors. 3. The March birthday party is scheduled for the last Sunday in March. Update: due to greens maintenance , the birthday party scheduled for March has been postponed until April 27th. There are four celebrants: Howard Mackey, Dave McMullen, Bob Schwartz and Des Simpson. The club will provide coffee and dessert. Bring your own lunch at noon to be followed immediately by bowling. 4. The board will put on one of the back tables duplicate and excess books on lawn bowling from our library. They will be left out for a short while available for free to any member who wishes to add them to their personal library. The remainder will be donated to a third party. 5. We will have a booth at the September Solano Stroll in an effort to increase membership. Although this does not happen until September 14th we will need volunteers to man the booth. Do not be surprised if you are approached to volunteer your time for this worthy endeavor. 6. 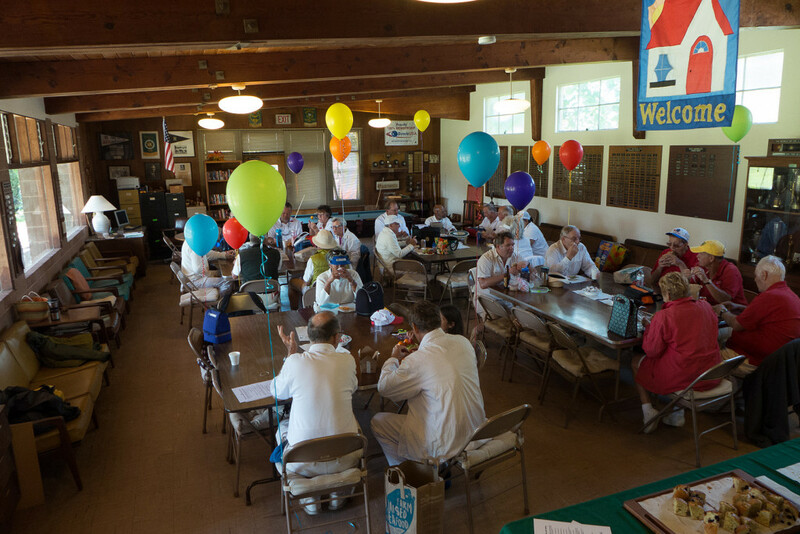 On the subject of volunteering the club functions much better if all the members participate in volunteering their time to the degree possible. Again do not be surprised if a board member respectfully asks that you consider doing some project for the good of the club. 7. 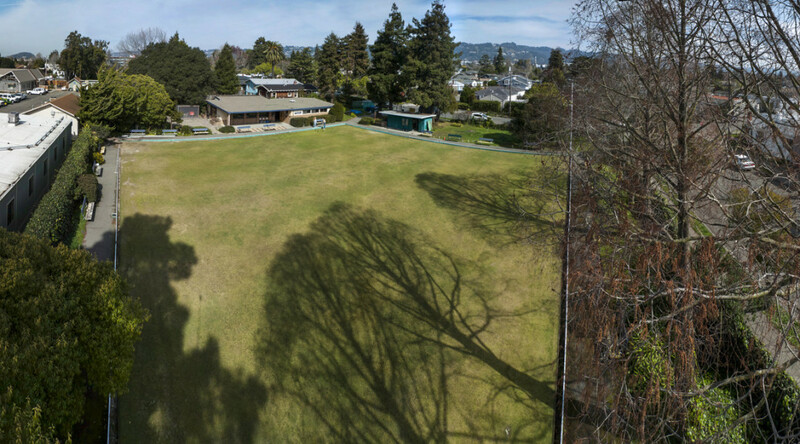 Opening day at Rossmoor is this Saturday, the 15th. Be sure and consult the calender in the clubhouse Cathy has prepared so you do not miss any upcoming tournements.